Yeah, why didn’t I have her Tea Roses Tea Room on my list of things to do in Cromwell? 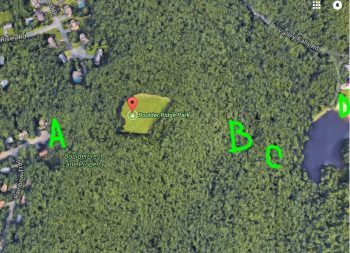 Believe it or not – and I’m sure you don’t believe it – I actually did have this place on my list of possibilities. I don’t remember why it didn’t make the final cut for me though. Upon reading Peggi’s comment, I added it back on the list. 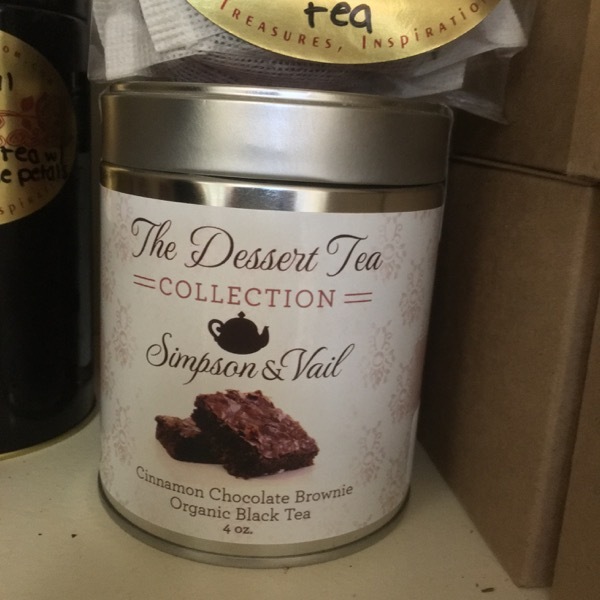 I was excited to experience the only English-style Tea Room in Connecticut! 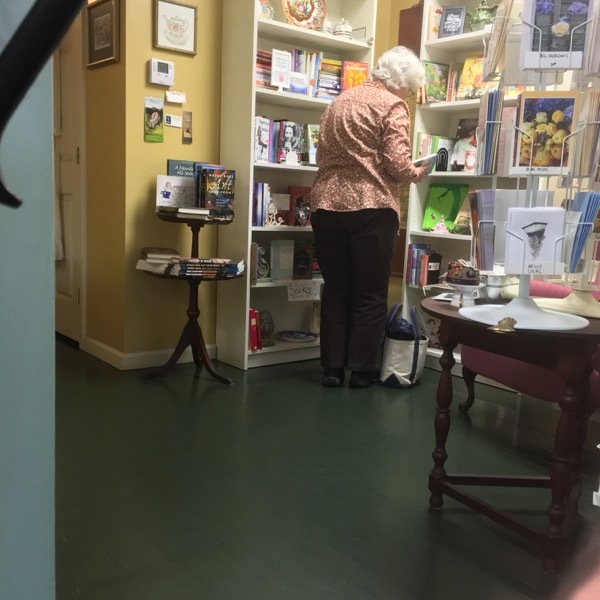 I mean… “only English-style Tea Room in the greater Central Connecticut area.” But she wrote “shop” as “shoppe,” so how could I ignore this place? 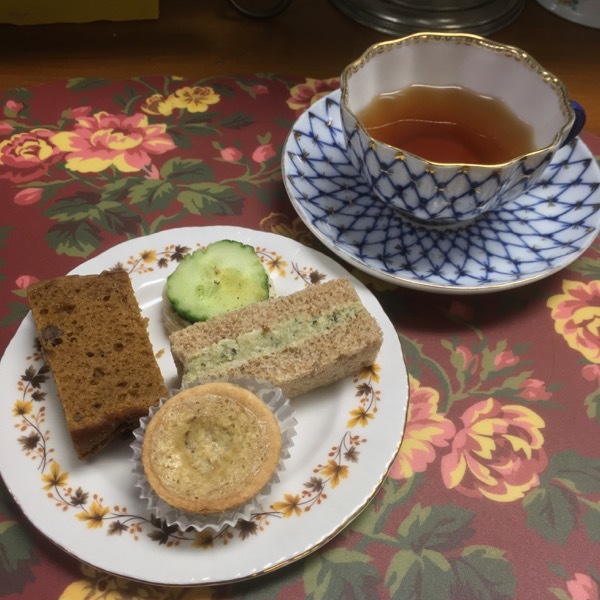 I had never been to a formal tea before. 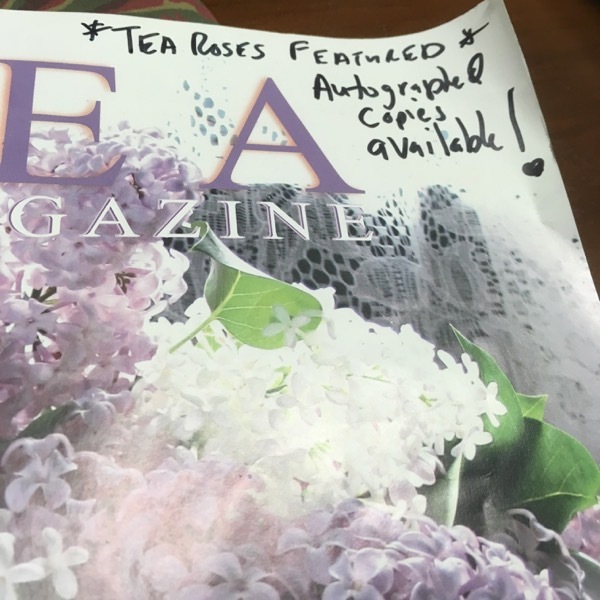 I have been to the wonderful Mrs. Bridge’s Pantry out in Woodstock, but that place doesn’t really have the formality of Tea Roses. I’ve made gift purchases from West Hartford’s Green Tea House, which is decidedly Asian rather than English. And who better to join me for this delicate journey into an unknown world? My tea-loving mother? No. My lovely wife? No. A cultured grandmother I’m friendly with from work? No. 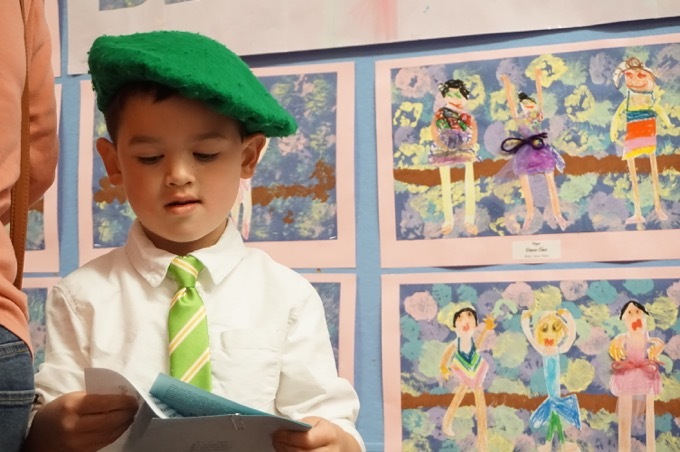 My six-year-old son who is most proud of his recent ability to “armpit fart”? Sure, why not. That makes perfect sense. This kid. I brought this kid. 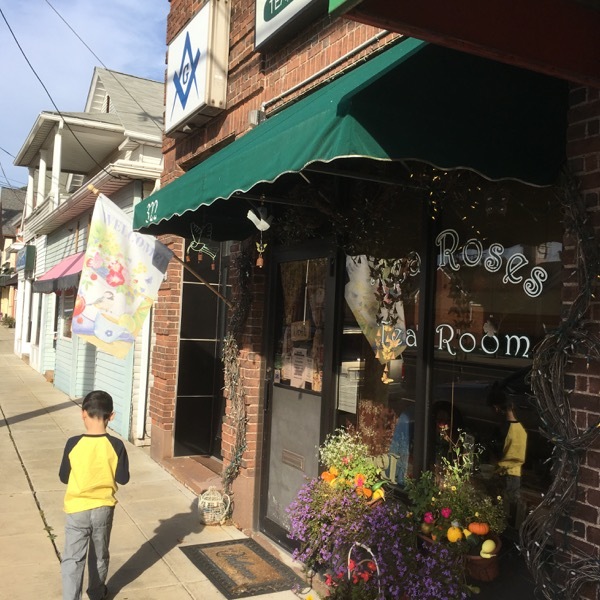 Tea Roses fronts Cromwell’s Main Street, across from the Fire/Police complex. I don’t use the word “cute” except to describe my wife and sons. But goshdarnit, this place is cute. There’s the cutest little table for two at the front picture window… I can’t even. 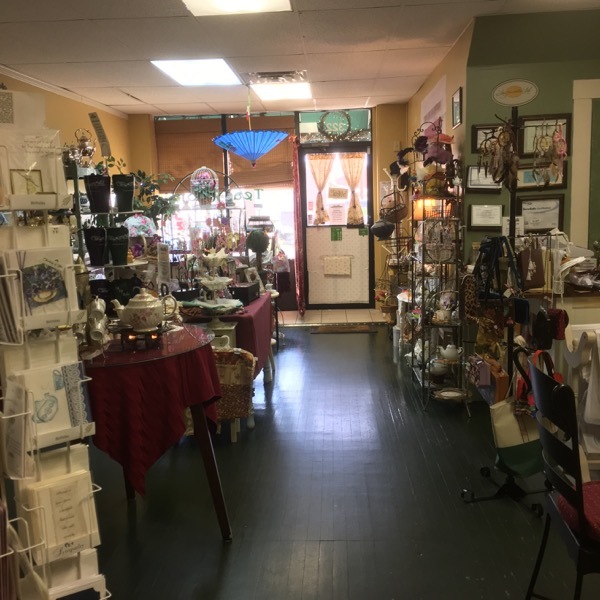 The front room – errr – the shoppe is filled with every bit of tea-alia you could imagine. There appears to be a tea culture large enough to support many tea-centric businesses around the state. I was in very unfamiliar territory to say the least. A spot was made for me and my son at the counter. (The two-top was reserved.) 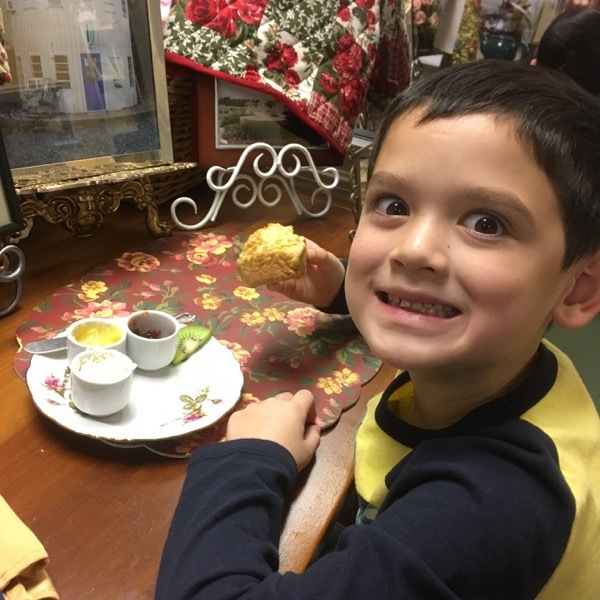 No one seemed too weirded out that a disheveled 40-something man and his kid were jazzed about afternoon tea. Calvin had an ice-skating party to get to across town, and he loves scones, so that was my opening salvo. “We only have about 25 minutes and he loves scones. I figured a tea room has scones, right?” Feigning total ignorance works well in these situations. These were legitimate questions. Tea for me is throwing a bag of whatever in a cup of water that just came out of the microwave. I do love iced tea though. I should have asked if they had iced tea. Would that have been crass? Answering my questions with total professionalism and politeness, the server guided me through the menu and the process: Here’s a list of teas. Pick one. So very complicated. Tea Roses Tea Room was named after the owner (and CTMQ commenter) Peggi’s aunt Rose, “a strong matriarchal woman who was an inspiration” for her. 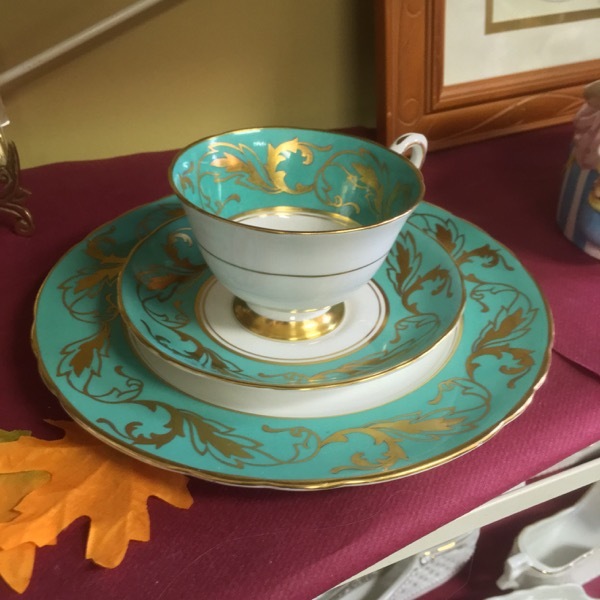 Many of the dishes, furniture and other items in the shop once belonged to her aunt. I also ordered some tea sandwiches after dumbly asking, “Do you have that here? I guess I should have some tea sandwiches with tea at an English Tea Room, right?” My “baffled ignorance” shtick was probably wearing thin. I tried to overhear the employees/owner making fun of me, but to their immense credit, they did not. Or were smart enough to be sure I was out of earshot. While we waited, I poked around some more. 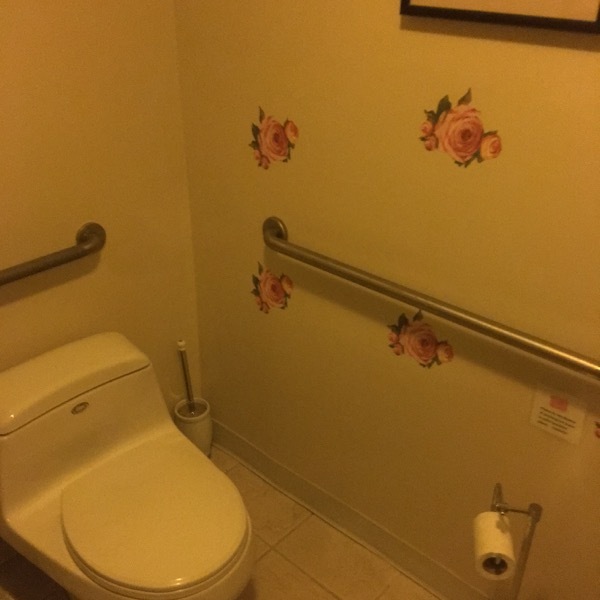 The bathrooms are just darling! And, wow, there’s a whole dining room in the back! It was filled with a dozen women of a certain age; sipping tea and nibbling tea room delights. It was the kind of scene where you get the feeling that if one of the women were to delicately belch, silence would be followed by a dropped teacup shattering on the floor as 11 other women of a certain age draw in their collective breath, alight their gloved hands across their clavicles, and catch the vapors. Hm. I guess this goes into effect with kid parties? Still seems odd. I returned to my seat next to Calvin. “Would the young Master like some milk with his scone?” the young clown child was asked. “No thank you,” he replied. Huh? The quiet classical strings playing over the sound system had apparently affected my child. To the good! 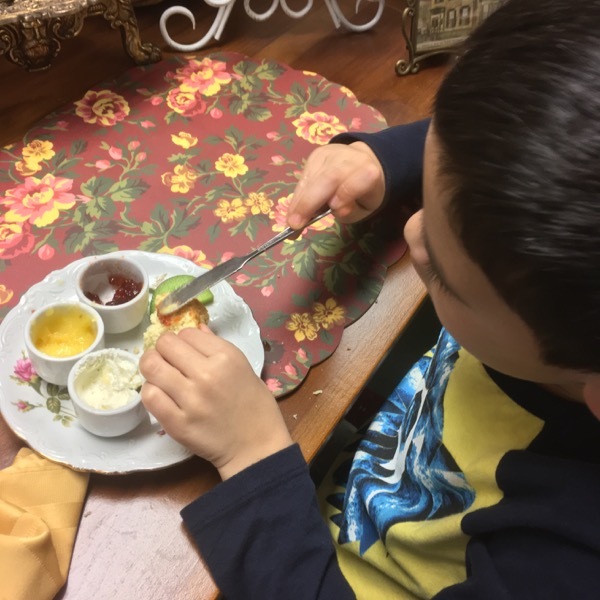 The “young master” was served his scone with 3 spreads: A housemade lemon curd, some sort of thick cream (not clotted cream though), and strawberry preserves. 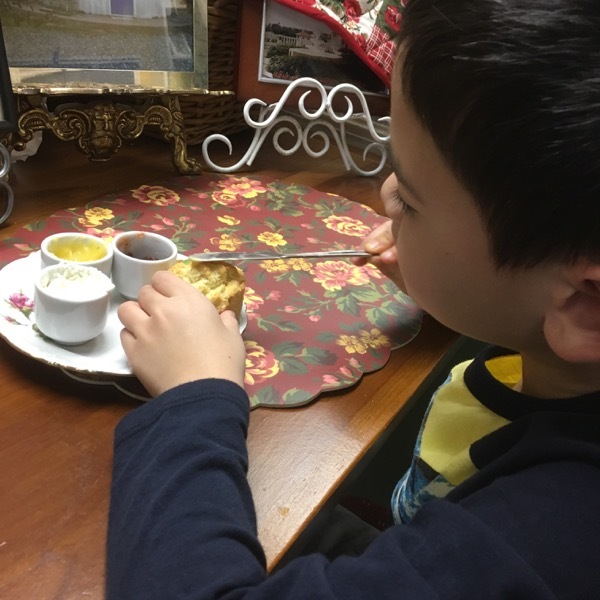 I watched as the Young Master delicately spread the lemon curd upon the golden yellow surface of his scone. The boy kills me. I was served my (Organic! Fair Trade!) “Congo Bongo” black tea. I loved it! Very fruity and sweet; I can’t imagine people add any sweetener to this tea – says this black coffee drinker. Ah yes, my tea sandwiches – I’d never had tea sandwiches in my life. Goodness, they are so… so… what’s the word… cute. Calvin laughed at the idea of his “big ol’ Papa” eating such tiny, delicate sandwiches. He found the idea of a “cucumber sandwich” ridiculous. There we were; two boys listening to Debussy while surrounded by gingham, floral prints, women over 80, eating dainty little English tea items. A mini quiche Lorraine, a baby pumpkin bread sandwich with cream cheese, a petite cucumber salad type sandwich… enjoying life. 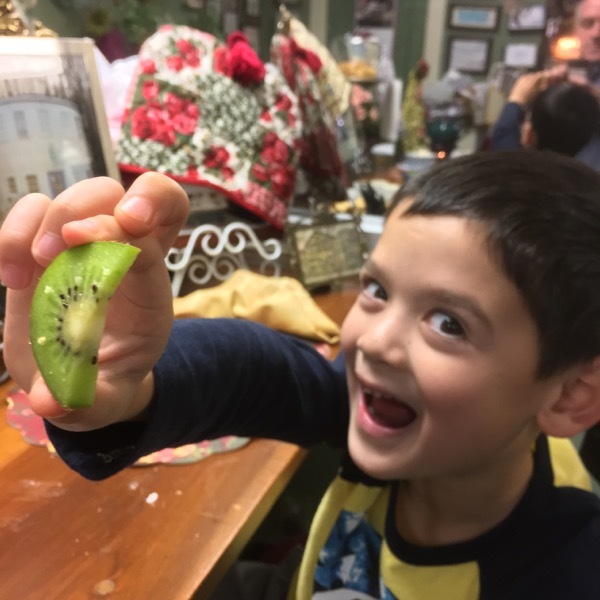 Then Calvin remembered the one thing in the world that I’m allergic to (kiwi) and began taunting me with it. We paid the bill ($16.40) and went skating; keeping our little tea room date to ourselves. I had a genuinely fun time. Yes, it was completely outside of my world, but it was pretty neat to experience. I can definitely see the allure of such places. That said, I see no need to go to any more “authentic English tea rooms” for the purposes of this site. Sorry Woodstock, New Hartford, Seymour, Ridgefield, etc. But that doesn’t mean that Calvin and I won’t enjoy another afternoon tea at some point on the down low.